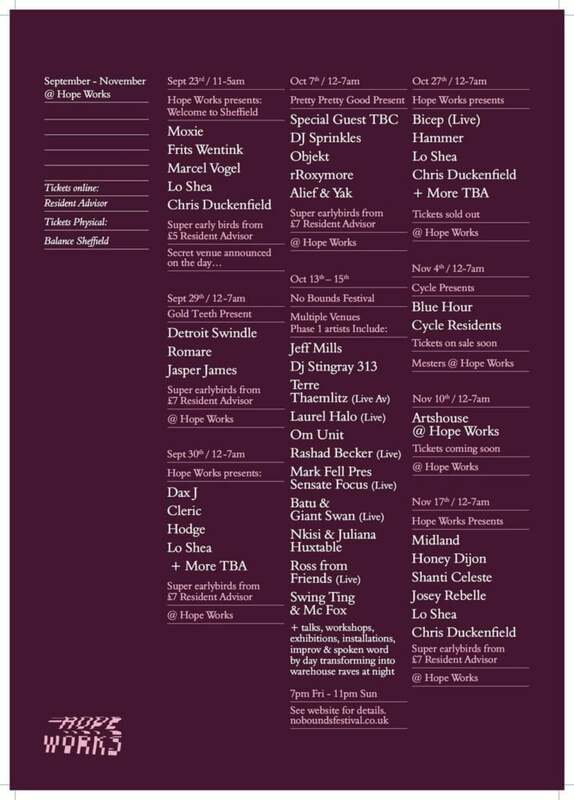 The full season for September to November at Hope Works has been released, with headliners Moxie, Artwork, Midland and Dax J heading up the new events. Seven more events have been added to the techno warehouse’s listings, which already featured Bicep (Live) and No Bounds Festival with Jeff Mills, DJ Stingray 313 and many more. Moxie headlines the opening party alongside Frits Wentink and Marcel Vogel at a secret venue to be announced on the day. Pretty Pretty Good have announced their 2nd event of the term on Saturday October 7th with DJ Sprinkles, Objekt, rRoxymore and a special guest TBA; while Cycle are back in the Little Mesters room with Blue Hour on November 4th. In other news, Gold Teeth also return to Hope Works for a triple-booking of Dutch house duo Detroit Swindle, Romare and Jasper James. To view the full listings for Sheffield’s nightlife September and October head here. Tickets are available now from Resident Advisor.